New Age Oilfield Services Inc. - 25,147 SQ.FT. A-1 Portables - 17,030 sq.ft. 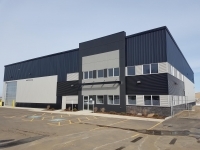 Cloverdale Paint Building - 18,070 sq.ft. Ariss Controls & Electric - 10,207 SQ.FT. Matrix Building - 12,000 sq.ft. Aluma Systems - 36,000 sq.ft.